Life does throw us a difficult challenge every now and then that tests our emotional mettle. These challenges can come in the form of anything really. Lack of funds to finish college, unemployment or loss of a job, a breakup or divorce, death of someone close, injury, illness, failure of a business venture we were upbeat about…the list goes on. Some of us curse and dwell on the negatives, never seeing a positive in anything. Others adopt an indifferent attitude, and prefer playing it safe than taking on life and bearing its scars in the process. And then there are those who never seem unfazed no matter what hits them. They always appear to be up to the challenge and manage to give off this impression that they have some innate adult secrets to help them manage challenges, secrets the rest of us were never privy to. The latter lot, we all admire. We look up to them to help provide the life answers we always seem to miss. They motivate and inspire us. These inspirational figures who seem to go through life unruffled also face challenges. Many challenges. But it’s how they respond to those challenges that makes the difference. Not that they had any handbook or map to navigate the maze of life. No one does. There is no ready-made secret sauce. That would be counterintuitive to our whole purpose here. We just have to dive deep into the deep end to figure it out for ourselves, each with their own personal journey and purpose to fulfil before calling it time on earth. But there are things we can learn from these inspiring people. Looking at their life story, we can pick up a thing or two from their blueprint. One is attitude. We are always reminded that a change in perspective can make a world of difference. Another is resilience. The grit to get back on our feet when the rug of life is pulled from under our feet. Some will say hope. Either has a remarkable power on us. Incredible to say the least. An image that comes to mind is that of Louis Zamperini, an Olympic athlete-turned-bombardier cast in the wartime drama Unbroken that is based off an astounding true story. Zamperini finds himself trapped at sea with a few of his fellow airmen where they drift for a month-and-a-half in a deflating raft. Lacerated and starving, they have to endure the blazing sun, the swells of the seas and circling sharks. Eventually, what is supposed to be an end to an excruciating ordeal sees them end up captured by Japanese soldiers who transfers them to a prisoner of war camp which was under the command of a sadistic guard going by the name of Watanabe. They had nicknamed him The Bird. Out of his personal spite for Zamperini whom he recognised from his Olympic exploits, at one time, The Bird orders him to clean a pigsty with his bare hands. Another time, he orders two hundred fellow prisoners to queue up and take turns punching Zamperini on the face as hard as possible. But the film’s real emotional centre unfolds when the guard orders Zamperini to lift a heavy railway sleeper over his head for over half an hour. If he dropped it, he would be shot dead. He doesn’t, much to the chagrin of the guard. The overall theme of this true story focuses on the unbreakable human nature (during the war), and that of Zamperini, an individual who struggles to stand on his feet no matter how much life batters him, including those times when the odds seemed stacked against him. If you haven’t watched it, slot it right into your list. The focus of this post was not on Zamperini, but on another man whose remarkable determination and resilience in life has seen him overcome great adversity. The man in question is Andrew Marr, and anyone who follows British politics should have an idea who he is. Andrew Marr is a journalist and one of the most respected political broadcasters in Britain. His flagship politics show on Sunday morning, The Andrew Marr Show, sees him play host to some of the most high-profile political figures around. But the veteran host has become famous for something else other than his engaging show on the BBC. In 2013, he suffered a severe stroke that paralysed his left side. The illness forced him to take a nine-month hiatus from his show in a bid to recuperate, the first two of which he spent in hospital receiving extensive physiotherapy to help him walk again. Through sheer determination, his mobility has gradually improved, although – in a typical dry wit – he describes his walk as more of a ‘drunken sailor’s lurch’. 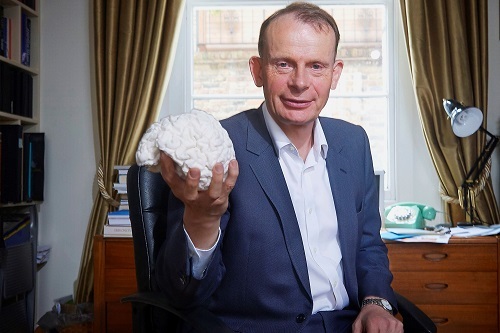 Recently, the veteran journalist took the extraordinary step of sharing his challenging story of recovery on national television in a one-off documentary dubbed Andrew Marr: My Brain and Me. He has previously said he didn’t fancy being the ‘poster boy’ for stroke recovery, maintaining that he just felt he owed it to other stroke victims to document his experiences in public (given his profile) for their benefit. In the film, he details the ups and downs of his path to recovery and the private determination he has had to conjure to do so. He hasn’t made much progress in the last year, and it is for this reason he decides to seek a range of trailblazing stroke treatments in Florida in a bid to see if his left side will improve. He makes a return to the hospital that saved his life for the first time where he meets the consultant who informed his family he might not make it. He also encounters other stroke survivors whose brains have been affected in different parts (and ways), and joins doctors who are trying to make inroads in solving not just the mysteries of the different effects of strokes, but also the mysteries of the most complex matter on the planet: the brain. Now, the damage that results from a stroke can have different effects which are usually determined by which part of the brain has been affected. This makes it one of the trickiest illnesses to cure. Because it’s nothing like breaking an arm, you see, whereby the doctor can detail specifics on how to go about effective recovery. In such a case, the doctor could (roughly) let you know the length of time you will put on a cast and when you will be healed. Unfortunately, a stroke is nothing like that. Each individual recovers differently. There are those who suffer relatively minor effects that do not last long. There are others who are hit so hard that they are reduced to dependency on other people. Some though (about one in eight) die within a month of suffering a stroke. Anyway, all through the film, Marr is not deflated and downbeat. Quite on the contrary actually. He’s focused. Upbeat. Never feeling sorry for himself. ‘There is no human crime like self-pity’, he says. Looking at the journey he’s been through, and the way he soldiers on with determination, Andrew Marr is nothing short of admirable and inspiring. It is definitely an attitude we could borrow to navigate through the challenges of life. It makes you realise as a human you can really achieve a lot if you put your positive mind to it. And this positivity doesn’t need to be inauthentic. No, like Marr, facing the reality with a dose of realism helps a lot. These days, he finds it a challenge to do many of the things he once took for granted, be it physical activity – he does not swim anymore, neither does he cycle, or ski – or perform as simple a task as tying his shoelaces or even slicing up his own steak in a restaurant. But what the hell – he can work well, he can get on the tube, follow his hobbies, get up and down the stairs, and generally he has a good life, he says, while not oblivious of the fact that there is a big chance he may never get his whole range of movement back. Talk about focusing on what you’ve got rather than what you haven’t got! And this, dear readers, is the message I want you to reflect on. Life may never be as picture-perfect as we may want it to be, but there is always something worth living for. However small. The difficult part is trying to establish what. And that is where attitude comes in. Rather than be negative and bitter, we can choose to replicate those inspiring figures who never seem deterred by setbacks. Spirituality teaches us that the key to unlocking life is embracing the present (the right here and right now) as it is: the good with the bad, the love with the loss, the wonderful with the tragic, and the life with the death. It reminds us that surrendering to the reality of who we are gives us a chance to do what we can do. When we are faced with challenges, we have to believe that whatever happened, happened to teach us something, not punish us. And the key to that? – attitude and resilience (you can also throw determination and/or hope in there if you like). These two go hand in hand, and the best thing about them is that they are not reserved for a select few. They can be learned. By anyone!